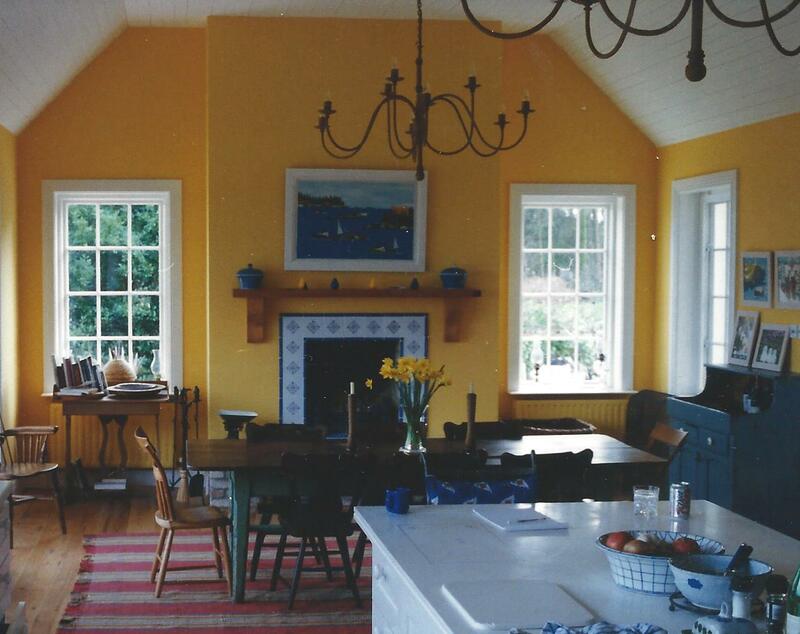 In 1998 we had the great fortune to be asked to purchase an entire house full of Canadian antique furnishings for a country home near Galway, Ireland. A lovely couple whom we had done good business with over the years wanted to make their newly purchased Irish retreat contain the warmth and aesthetic of early Canadiana furniture, of Irish-Canadian decent where possible. They had a long wish list, and entrusted us to search and come up with a few best candidates for each item. We sent photographs and particulars, from which they would pick the winner. Then we would buy the items and bring them to a shipper in Toronto, who held them until the list was complete when they packed and shipped them in one large container. It worked well, and we made a lot of our fellow dealers happy by buying up their expensive items. It’s fun spending other people’s money. 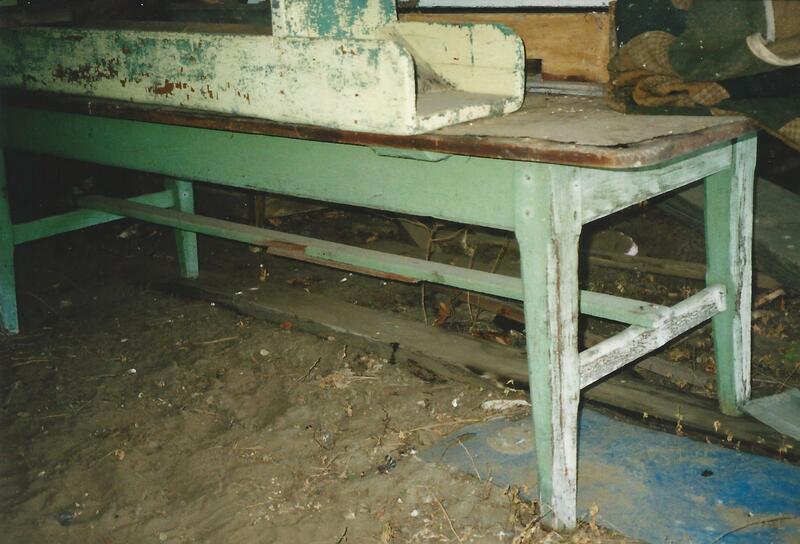 The one thing our friends were keen on having was a great, original harvest table of about 9 or ten feet in length. Something solid at the right height, with a naturally smooth and attractive original finish. Not an easy order to fill. We bought many wonderful pieces over the next 12 months but the all-important harvest table continued to eluded us. Lots of well-made re-builds on offer, but nothing original. We were growing concerned because the shipping date loomed, so I started calling everyone I knew, dealer and collector alike to ask if they didn’t know of something. 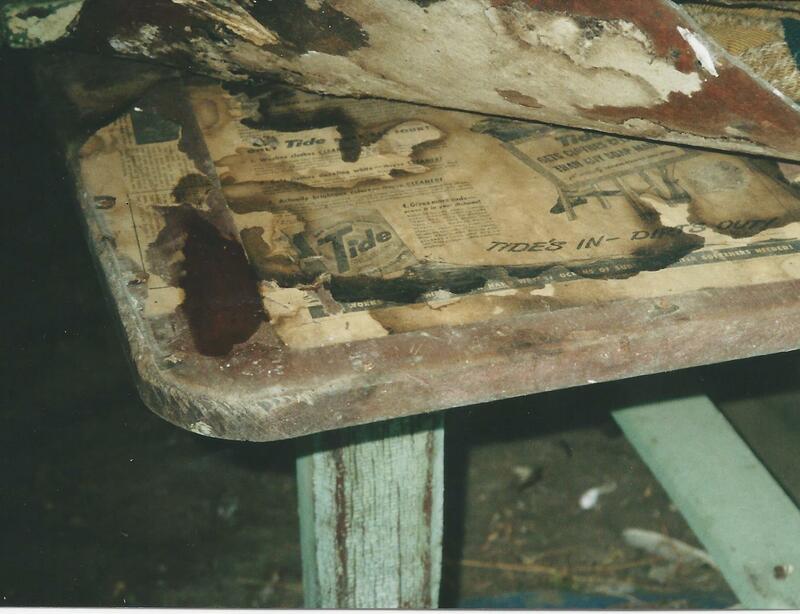 Eventually it was Bill Dobson (thanks again Bill) who recalled that a retired, Eastern Ontario collector/dealer of high repute had been storing away just such a table. He did not know if it would still be there, or if it was for sale, but he gave me a name and number, along with a warning that if it was available it would be a lot of money and deservedly so. He also advised me to tread softly as this gentleman was an honest and reliable person, but was not known to suffer fools. I called the next morning. The fellow who answered was indeed a bit stern and suspicious at first, but after several minutes of establishing mutual friendships, and exchanging philosophies that we arrived at the point where I was told that yes there was a table, and it could be for sale, but for a price that was non-negotiable. I became excited as he described it. Nine feet long, decent width, Irish-Canadian family from Eastern Ontario, circa 1840, ”H” shaped stretcher base, original red stained pine boards on top, bottom with early apple green oil paint over the red stain. No repairs, and no apologies. It ticked all the boxes. “Can I come and see it” “Sure, if you are seriously interested, and o.k. with the price which is $_,000, and as I said before non-negotiable.” A chunk of cash for sure, but if it was as described, it was rare and exclusive and therefore a piece were the seller can pretty much name his price. I assured him I was serious and so we made the arrangement for me to come the very next day. A twelve-hour drive, there and back to look at a table. I’d say I was serious. On arriving I felt a bit anxious, but soon relaxed when I found my host to be intelligent, knowledgeable, and interesting. We had a great talk and a good look around his home and out buildings before heading out to an open drive shed in the middle of a cattle field. There, covered with a tarp, resting upside down about eye level on top of a large piece of farm machinery rose the magnificent green tapered legs with stretcher. 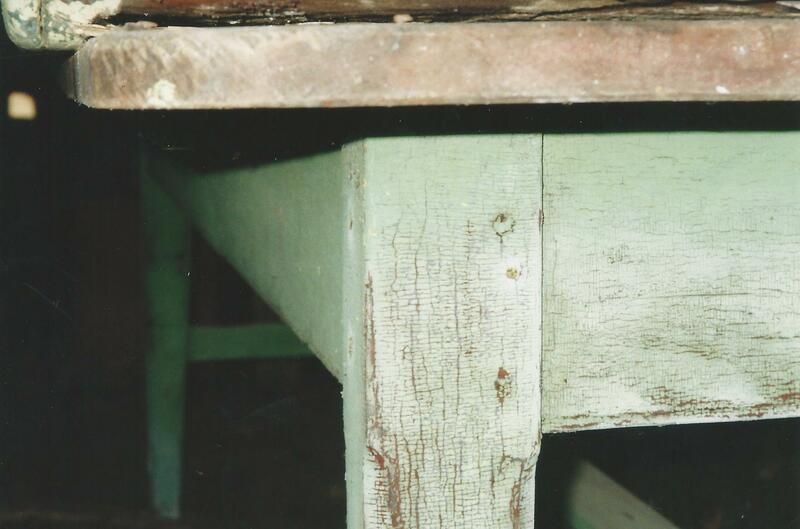 What I could see of the top was covered with linoleum, and so I asked “what about the top?” Are there are any problems like it being gouged or badly stained?” “The top is excellent and untouched. There’s no problem.” To bring it down and flip it over was a big deal, and his reputation and my gut told me to trust him so I did some measurements, took some pictures and went home. After talking with my clients, and getting an enthusiastic thumbs up, I found myself arranging to pick up the table the following week on our way back home from a Quebec trip. Jeanine was on board this time. In Quebec we happily filled our van with smalls, and then started home. About two in the afternoon we were near Cornwall, when I phoned ahead to make sure we were still on track for picking up the table. “I’m here and ready for you, and by the way you are bringing cash, right.” “Cash? That’s a lot of money to be walking around with. No, I just assumed you would take my cheque.” “No I’m sorry, not that I don’t trust you, but it has to be cash or no deal”. “O.k. I understand. leave it with me and I’ll figure something out and call you if there is a problem. Otherwise we’ll see you soon.” We banked with Canada Trust and so we drove directly to a Cornwall branch in a suburban strip mall near the highway to see what we could do. We were fortunate in that as the staff explained, they do not usually have that amount of cash available with such short notice, but as it happened they had just received a large cash deposit so they could do it. We left a few minutes later with a big brown grocery bag full of mostly small bills. It felt like a heist. We drove directly to our destination and after a long counting session, and a lot of friendly talk along with a nice cool beverage, we found ourselves out at the drive shed with the cows mulling around us, trying to see what the action was. I backed up the van to the table, and saw that it lined up perfectly to be slid directly onto the roof rack. There had been talk of bringing it down and lifting the linoleum but I could see that it would be best to leave the linoleum in place to protect the surface, and it was so damned convenient to just slide it forward. “So if you’re sure that the top is O.K., let’s just slide it on and tie it down.” “If it is not as I told you, and you are unhappy, bring it back and I’ll return your money.” I knew he was sincere so off we went, paying out all that cash for a table without having seen the top of it. Well placed faith in your fellow-man, or just plain fool hardy. It would soon be revealed. We got home about midnight and so it was first thing the following morning that I had my worker help me take the table up into the church. I gingerly lifted the linoleum which was held on by just a few small tacks around the perimeter and after peeling off a couple of layers of old newspaper I beheld just what I wanted to see. A superb, original top with undisturbed patina and no gouges or ugly stains. Just as advertised. It cleaned up beautifully, and a few days later I dropped it off at the shippers, soon to be on it’s way. We had the thrill and honor of visiting our friends/clients in Ireland the following year to see the finished project, and it was an absolute delight for us to sit and dine with them at this splendid Irish-Canadian table that had made it’s way to a new home in Ireland.